A unique new factory has started up in the eastern Coachella Valley near Indio, CA building modular homes that can withstand natural disasters like devastating wildfires and floods. 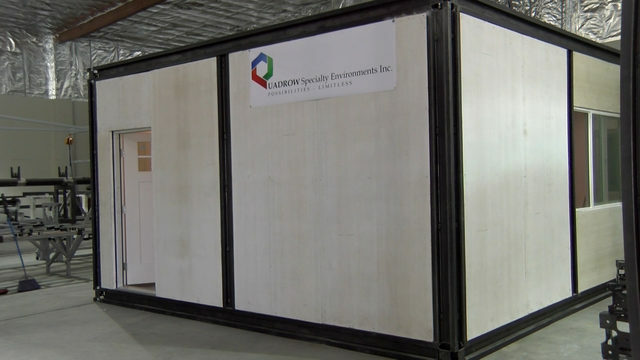 At a recent open house for Quadrow Specialty Environments, a blow torch burning at more than 800 degrees for more than an hour was not able to burn through the material the company uses to build homes. Walls are made of magnesium oxide and are supported with steel. With homes burning in wildfires across Southern California, engineers at Quadrow said people could turn to the latest technology to rebuild. Their design, while not the prettiest in town, has one unique feature that could make this ideal for wildfire, earthquake, tornado, hurricane, insect and mold protection. The outer skin could be covered with a variety of exterior products including vinyl siding and the core of the house would remain protected. I predict this new startup will find a small but eager market for its homes mostly in wildfire prone areas but don’t expect much customization in their design. "Nothing is going to break and nothing is going to crack. It has all been designed to withstand earthquakes, hurricanes, all these natural forces, including floods," said Guy Assif, CEO of Quadrow Specialty Environments. In considering the recent California fires this is great!! However, the next steps need to be taken. In order for buildings to be livable they will need windows for viewing and fresh air. Obviously this presents a problem because radiant heat can penetrate glass and ignite the interior. Hence they either need glass which reflects all radiant heat, or else they need shutters which automatically close all openings when a fire occurs. Both of which can be implemented automatically at relatively low cost and without the need to electricity. (I'm and engineer and would be glad to help you with this.) From a livability standpoint, vaulting the ceiling would make it seem a whole lot more spacious, comfortable and livable. As someone who lost 3 homes in the "Camp Fire" in Paradise CA I would really like to team up wit you about this.